Yesterday, there was the familiar in-between-meals pang that got me walking down a street in search of something to kill my hunger. That and the possibility of my shifting base to another citiy got me to the pani puri. Cost of living indices across various Indian cities is a topic that has occupied my mind quite a bit in the recent past and taking a lettuce leaf out of the big Mac’s book, I thought of developing a pani puri index of affordability. I hit the internet on coming back to my pad, but gave up quickly. The prices of pani puri either seem to be a closely guarded secret or could be so low that the cost of hooking up to the internet for 10 minutes seems a lavish splurge in comparision. While still on the internet and the topic, I thought of killing some time in assorting and discovering things about this humble food of the masses in the sub-continent. For me personally, the Kolkata variety of this dish that is the best. I am no gastronome but since I’ve grown up in the east, stuffing these roundels down my throat – especially during the Durga Puja festival, I am biased. What’s the difference? Firstly, it’s called puchka, phochka or phuchka (depending on what stage are you in the devouring of this beauty) there; secondly, it’s obviously cheaper in the east – though the gap seems to have narrowed down of late and thirdly, the stuffing: its got mashed potato in it with a bits of gram et al thrown in for good measure. That’s the staple pani puri for me and will always be, but I’ve relished the other varieties as well. 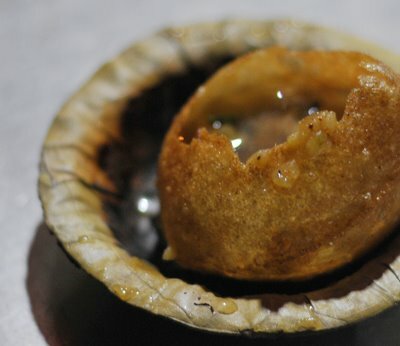 When in Lucknow, I thought that the vendor was loony for not understanding what a puchka was till I learnt that its called something like pani batasha or batasha there. 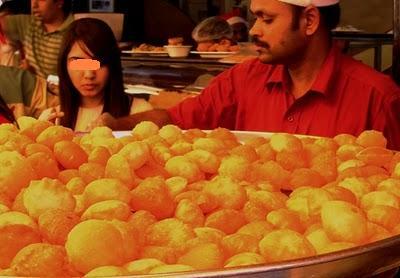 Apparently the Hindu heartland is where this puffy delight seems to have originated from. Then of course, there are the gol gappas (gol = round; gappa = that hurried act of stuffing and swallowing something decidedly challenging). The stuffing changes as you cover the breadth of the country ranging from boondi (I don’t want to translate that to English), gram, sev (fried semolina), etc. The water also flows different courses, some being mint flavoured, some carrying a strong infusion of tamarind and other pungent spices while others being sweeter and date flavoured. I dig the tamarind, pungent types. What to call them in English? Many people have attempted this before and I don’t know if an official term is out yet but let me add my two cents here. Some have called them water balls (sound like Holi missiles) and wheat bulbs (sounds like some smart alec invention at Monsanto). Some others have even called them fried balls? Yuck! Imagine: “I looked at my girlfriend, so pretty in her white cotton dress having Ramu’s fried balls by the main street – her eyes watering and the mascara threatening to run and the only remorse I felt was the fact that I had no small change in my wallet. All knew that Ramu’s were the best”. Whoops. Change fried balls to pani puri and I’ll bet you’ll be better off. So if papads became poppadums then should pani puris be called tangypops? Why not? How does it taste feel like? mmmmmm….when you bite, the gol explodes flooding your mouth with that sweet, tangy and hot infusion of a million flavours. India is a land of contradictions – yes, sweet and fiery do co-exist nicely in this small fried universe. There’s far more liquid than you’d imagine the little ball to have. It bites, it challenges and if you give in, it makes you choke. The urban chic brigade is going hep by using vodka instead of the spicy water – to each his own. Some vendors have started using mineral water for making the pani and plastic gloves obviously spurred by a Supreme Court of India directive to make such offerings more hygienic. But my real foodie buds feel that the taste of the dirty fingers crushing the puris in the center and dipping them in that pungent water kept ready since yesterday is the real heaven. Who cares about the innards – it’s always the entry that jangles the senses (if you know what I mean!) Heck, we’ve grown up forcing these spicy spheres into ourselves and nothing much has happened to us. Some of us even have the strength to blog after years of gorging. Some balls we have. But this gets me to the poser of the day: Do docs (i.e. the Hipocratic Oath types) eat the real hand crafted roadside ones? For that would make them watered down hypocrites, no? I haven ‘t noticed, but if you have please let me know. Who eats them? Nearly everyone, though a few are confirmed closet ball stuffers. Mostly women seem to gorge on it. Does that make it a sissy food? Hardly, if the challenging taste is any consideration. Or is it that a well made, spicy plate of this alkaline food threatens the male bastion by making men cry? Maybe the whole transaction has a subtle gay overhang – a guy giving another balls to eat. I don’t know, but I like to eat them. But yes, I tend to avoid the carts that have women flocking to them. Nothing like a quiet man to man deal. Is it cultural? You bet! There’s a recent T Series produced Bhojpuri song called Gol Gappa Khiyae Ke Balmuwa. I’m sure the lyrics would be quite interesting. Got it? Bhojpuri. Pani puri. 😐 Apologies. And then there’s the sartorial connection set up by Rish Oberoi, an ex investment bank employee who in an Andy Warholish adaption attempts to sell fashionable clothes each having a motif and graphical application of the puchka through his venture aptly called Paani Puri Clothing. And then of course there was the gol gappa eating contest beteen SRK and Anushka Sharma in the film Rab Ne Bana Di Jodi that was quite a mouthful. hii….do u, by any chance, know what’s the current situation of arvind’s golgappa chain? are they still running ? and how big is their business now?